Harrington Investments, Inc., (HII) a socially responsible investment advisory firm, has introduced a binding by-law amendment that would limit Monsanto Corporation's ability to protect directors when they violate their fiduciary duty in cases resulting in "harm to the natural environment, public health, or human rights." "Monsanto has a long history of selling potentially dangerous chemicals and genetically engineered products that may negatively impact human health and the global environment, as well as impair shareholder value," said John Harrington, President and CEO of Harrington Investments. "Corporate directors need to take personal responsibility in overseeing management to insure that the corporation's actions speak louder than the CEO's words." Hugh Grant, Monsanto's CEO, has recently written that "an unwavering commitment to integrity in all business operations is at the core of our corporate behavior. We must never take this commitment for granted. Integrity means doing what is right even when we are faced with situations not governed by any specific law or regulation. Sometimes the right thing to do is not clear, but at Monsanto our job is to seek and find the right answer in every business situation." Harrington echoed Grant's statement; adding "The bylaw amendment that we are proposing will assist Monsanto's management in the fulfillment of its stated commitment by reducing the likelihood that Monsanto's board of directors will tolerate practices that might tarnish their image or lead to damaging lawsuits." The proposed amendment is particularly relevant to Monsanto's board of directors. Monsanto has long been criticized for a wide array of alleged misconduct. In recent years, Monsanto has: paid a $1.5 million fine for bribing Indonesian officials, been accused of illegally importing genetically modified seed into the European Union, been found guilty of false advertising, paid tens of millions of dollars in fines for cleanup of pollution, and been fingered for illegally dumping toxic waste near a residential area. This resolution is the latest in Harrington Investments' long ownership advocacy relationship with Monsanto management. Last year, a similar proposal to restrict board indemnification was withdrawn on technical grounds. A 2005 resolution called for the formation of an ethics oversight committee in response to Monsanto being fined for violating the Foreign Corrupt Practices Act. That resolution never made it to the shareholder ballot because Securities and Exchange Commission staff allowed Monsanto to omit it from the proxy, deeming it "ordinary business." In prior years, HII has filed several proposals urging Monsanto to disclose its policies toward the sale of potentially carcinogenic pesticides. HII has also participated in a long-standing campaign to end the company's involvement with child labor in India. For the past 25 years, Harrington Investments, Inc. has been a pioneer in socially responsible investing and shareholder advocacy. HII manages approximately $200 million in assets for institutional and individual investors concerned with the social and environmental, as well as financial performance. In addition to Monsanto, Harrington has introduced several other binding corporate bylaw amendment resolutions this year. If approved, these bylaw proposals would result in such innovations as the creation of corporate human rights committees. Harrington concluded by saying: "As a responsible fiduciary, it is my job to promote corporate policies that will increase long-term shareholder value as well as protect global human rights and promote a safe and healthy environment." Rhetoric from Washington since the early 1990s proclaims that genetically modified (GM) foods are no different from their natural counterparts that have existed for centuries. But this is a political, not a scientific assertion. Numerous scientists at the FDA consistently described these newly introduced gene-spliced foods as cause for concern. In addition to their potential to produce hard-to-detect allergies and nutritional problems, the scientists said that "The possibility of unexpected, accidental changes in genetically engineered plants" might produce "unexpected high concentrations of plant toxicants." GM crops, they said, might have R 20;Increased levels of known naturally occurring toxins, . . . appearance of new, not previously identified" toxins, and an increased tendency to gather "toxic substances from the environment" such as "pesticides or heavy metals." They recommended testing every GM food "before it enters the marketplace." But the FDA was under orders from the first Bush White House to promote the biotechnology industry, and the political appointee in charge of agency policy was Monsanto's former attorney—later their vice president. The FDA policy ignored the scientists' warnings and allowed GM food crops onto the market without any required safety studies. From the few safety tests that have been conducted, the results are disturbing—lab animals fed GM diets show damage to virtually every system studied. Reports from farmers are even less encouraging—thousands of sick, sterile and dead animals are traced to GM feed. According to Arpad Pusztai, PhD, one of the world's leading experts in GM food safety assessments, the type of stomach lesions linked to the tomatoes "could lead to life-endangering hemorrhage, particularly in the elderly who use aspirin to prevent [blood clots]." Pusztai believes that the digestive tract should be the first target of GM food risk assessment, because the gut is the first (and largest) point of contact with the foods; it can reveal various reactions to toxins. He was upset, however, that the research on the FlavrSavr never looked passed the stomach to the intestines. Other studies that did look found problems. Mice were fed potatoes with an added bacterial gene, which produced an insecticide called Bt-toxin. Scientists analyzed the lower part of their small intestines (ileum) and found abnormal and damaged cells, as well as proliferative cell growth. Rats fed potatoes engineered to produce a different type of insecticide (GNA lectin from the snowdrop plant) also showed proliferative cell growth in both the stomach and intestinal walls. Although the guts of rats fed GM peas were not examined for cell growth, the intestines were mysteriously heavier; possibly resulting from such growth. Cell proliferation can be a precursor to cancer and is of special concern. Rats fed the GNA lectin potatoes described above had smaller and partially atrophied livers. Rats fed Monsanto's Mon 863 corn, engineered to produce Bt-toxin, had liver lesions and other indications of toxicity. Rabbits fed GM soy showed altered enzyme production in their livers as well as higher metabolic activity. The livers of rats fed Roundup Ready canola were 12%–16% heavier, possibly due to liver disease or inflammation. And microscopic analysis of the livers of mice fed Roundup Ready soybeans revealed altered gene expression and structural and functional changes. Many of these changes reversed after the mice diet was switched to non-GM soy, indicating that GM soy was the culprit. The findings, according to molecular geneticist Michael Antoniou, PhD, "are not random and must reflect some 'insult' on the liver by the GM soy." Antoniou, who does human gene therapy research in King's College London, said that although the long-term consequences of the GM soy diet are not known, it "could lead to liver damage and consequently general toxemia." Some studies showed higher death rates in GM-fed animals. In the FlavrSavr tomato study, for example, a note in the appendix indicated that 7 of 40 rats died within two weeks and were replaced. In another study, chickens fed the herbicide tolerant "Liberty Link" corn died at twice the rate of those fed natural corn. But in these two industry-funded studies, the deaths were dismissed without ade quate explanation or follow-up. In addition, the cells in the pancreas of mice fed Roundup Ready soy had profound changes and produced significantly less digestive enzymes; in rats fed a GM potato, the pancreas was enlarged. In various analyses of kidneys, GM-fed animals showed lesions, toxicity, altered enzyme production or inflammation. Enzyme production in the hearts of mice was altered by GM soy. And GM potatoes caused slower growth in the brain of rats. 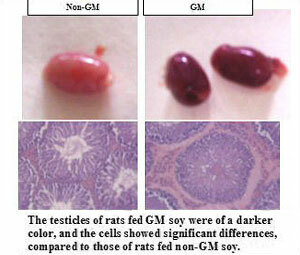 In both mice and rats fed Roundup Ready soybeans, their testicles showed dramatic changes. In rats, the organs were dark blue instead of pink. In mice, young sperm cells were altered. Embryos of GM soy-fed mice also showed temporary changes in their DNA function, compared to those whose parents were fed non-GM soy. Over a series of three experiments, 51.6 percent of the offspring from the GM-fed group died within the first three weeks, compared to 10 percent from the non-GM soy group, and 8.1 percent for non-soy controls. "High pup mortality was characteristic of every litter from mothers fed the GM soy flour." The average size and weight of the GM-fed offspring was quite a bit smaller. In a preliminary study, the GM-fed offspring were unable to conceive. After the three feeding trials, the supplier of rat food used at the Russian laboratory began using GM soy in their formulation. Since all the rats housed at the facility were now eating GM soy, no non-GM fed controls were available for subsequent GM feeding trials; follow-up studies were canceled. After two months on the GM soy diet, however, the infant mortality rate of rats throughout the facility had skyrocketed to 55.3 percent (99 of 179). When Indian shepherds let their sheep graze continuously on Bt cotton plants, within 5-7 days, one out of four sheep died. There was an estimated 10,000 sheep deaths in the region in 2006, with more reported in 2007. Post mortems on the sheep showed severe irritation and black patches in both intestines and liver (as well as enlarged bile ducts). Investigators said preliminary evidence "strongly suggests that the sheep mortality was due to a toxin. . . . most probably Bt-toxin." The warnings of the FDA scientists appear to have come true. But we were not supposed to know about their concerns. The agency's internal memos were only made public due to a lawsuit. Instead, we were supposed to believe the official FDA policy, claiming that the agency is not aware of information showing that GM foods are meaningfully different. This statement, crafted by political appointees, directly contradicts the scientific consensus at the FDA. Nearly every independent animal feeding safety study on GM foods shows adverse or unexplained effects. But we were not supposed to know about these problems either—the biotech industry works overtime to try to hide them. Industry studies described above, for example, are neither peer-reviewed nor published. It took lawsuits to make two of them available. And adverse findings by independent scientists are often suppressed, ignored, or denied. Moreover, researchers that discover problems from GM foods have been fired, stripped of responsibilities, deprived of tenure, and even threatened. The myth that GM crops are the same safe food we have always eaten continues to circulate. With the overwhelming evidence of problems since their introduction in 1996, however, it is likely that GM foods are contributing to the deterioration of health in the United States. Without human clinical trials or post-marketing surveillance, we can't tell which worsening health statistic may be due to these foods. But we also can't afford to wait until we find out. GM foods must be removed from our diet immediately. Fortunately, more and more people are making healthy non-GM choices for themselves and their family. To learn which foods are genetically modified and how to protect yourself, visit www.GeneticRoulette.com. A report recommending Australian farmers be allowed to grow genetically modified crops from next year has been released by the federal government. Agriculture Minister Peter McGauran says the report brings together a wide range of current information on GM crops, particularly canola. "Covering everything from regulation, supply chain management and market acceptance of GM crops to agronomic, economic and legal liability issues at farm level, this package is intended to make a well-informed contribution to the current debate about the GM crops," Mr McGauran said. Queensland is the only Australian state in which GM food crops can be grown, with bans in place in NSW and Victoria under review. "With reviews of the moratoriums under way in four states, Australian farmers will potentially start growing GM canola from 2008," he said. Mr McGauran said Australian farmers stood to gain significantly from the introduction of GM technology. But there is still strong opposition to GM crops from environmental groups and some health and nutrition experts. Mr McGauran said the report, entitled GM Canola: An Information Package, provided a positive response to such opposition, pointing out that GM canola has been farmed in other countries for a decade without any reported health problems. "The study concludes that Australia's main competitor, Canada, has been growing GM canola for 10 years without any appreciable loss of market share or prices, while enjoying significant agronomic benefits," Mr McGauran said. The report produced by the consultancy firm ACIL Tasman says GM canola also offers solutions to problems facing conventional canola in Australia. It listed advantages in winter crop rotations, saying weeds had become resistant to chemicals used in conventional canola cultivation, as had some plant diseases. "This report adds further weight to the argument that state governments should immediately lift their moratoriums on GM crops so that Australian farmers can have access to the benefits of this technology," Mr McGauran said. "Australian farmers are extremely efficient and innovative producers, but to remain internationally competitive, need to be able to compete." The release of genetically modified crops denies farmers and consumers their right to fields and food that are free of transgenics. There is no way to avoid the pollution of seeds, crops and food. Promoters of this technology claim that farmers must have the right to choose the seeds they wish to plant. The problem is that the impossibility of keeping transgenic seeds under control is preventing farmers from being able to choose what they do not want to plant. Here are three cases in point, all from western Paraná, in one of Brazil's major agricultural regions. Ademir and Vilma Ferronato live in Medianeira, western Paraná State, where they farm 16 hectares (40 acres) of organic crops. In addition to soybeans and corn as cash crops, the couple grows green vegetables, livestock and an orchard, which supply them with healthy and diversified food, all produced ecologically. Most of their neighbors, however, plant conventional or transgenic soybeans. When they sold their 2007 harvest, however, the Ferronatos were surprised to have their soybeans rejected by the Gebana company, which markets organic produce and normally purchases the family's production. Tests detected the presence of GM soybeans mixed into their organic harvest. The seeds had actually been provided by Gebana, which tests all the batches before delivering them to farmers. The seeds sold to the family had tested negative for transgenic soybeans. Ademir and Wilma believe the pollution took place during the harvest. In late 2006, they planted their soybeans in two stages, to have time to hoe the weeds out of the whole area. The first section they harvested was approximately seven hectares, and they sold the crop as organic. It was the second area - covering a little over four hectares - that tested GM-positive. They used the same combine both times, but the first time it had only been used to harvest conventional soybeans. The second time, it had also been used in GM soybean fields. It was cleaned following the certifying agency's orientations, but it apparently had not been cleaned thoroughly enough. There was no way to avoid the loss. The first harvest yielded 280 bags, sold at R$40.00 each. The 140 bags harvested from the other four hectares were sold for only R$28.50 each. The family's loss was thus R$1,610.00 (approximately US$800.00). When the Guerini family moved to São Miguel do Iguaçu, they chose the farm based on their style of farming. After 20 years growing soybeans in Paraguay, they decided to go organic, and have a smaller impact on the environment. Looking for better ecological conditions over the area, they finally settled on a 1,500 hectare (3,700 acres) farm bordering on Iguaçu National Park, one of the world's most important conservation units. They plant mainly soybeans and corn, on an area of 130 hectares. Most of their neighbors are large-scale monoculture farms, with soybeans in the summer, followed by corn in the autumn-winter season. Silvio Guerini explains that the ecological advantage of having the park next door is canceled out by proximity of neighboring farms that use pesticides. "During the soybean season, the smell of pesticides comes all the way into our home," he complains. Moreover, pests end up being "pushed" onto his fields, sometimes by the spraying and other times due to the simultaneous harvests on huge areas that leave them with nothing else to eat. During the 2006-2007 season, a new factor made things even harder for the Guerinis - the pollution of their organic soybeans with transgenic beans. They do their harvesting with their own machinery, which is only used there, so this potential source was discarded. The seeds were certified and had tested negative for GM-soybeans using the PCR method. Only the first load they sold was polluted. The only difference between that load and the others was the truck used to transport the first soybeans to the Gebana silos, which was the company's truck rather than their own. Since he was aware of the potential problem, Silvio had monitored the sweeping out of the truck bin before the first shipment was loaded. Even so, he was unable to sell that part of his harvest as organic. Although there are still no official statistics on this problem in Brazil, reports of farmers who have been forced out of the organic system have been on the rise every year, in all major soybean-growing States. Just taking the Gebana company as an example, in 2006 they identified four cases of pollution, and the figure more than doubled to nine cases in 2007. Farmers working with Gebana are a small universe, statistically, but they illustrate well the situation of soybean farmers in all areas of Brazil. João Bússulo lives in the Linha Alegria Rural Community, in Medianeira. He grows soybeans, corn, oats, sorghum and sunflower. He also has an orchard and raises a dairy cows for his family's own consumption. In 2006 he purchased soybean seeds from a local cooperative. He intended to sell the entire harvest to the Sadia company, which prefers and pays a 5% premium for conventional, non-GM soybeans. To keep their harvest GM-free, the family has their own equipment for planting and harvest. The seeds they bought were labeled "transgenic-free product." João planted 17 hectares (42 acres) with conventional soybeans and harvested 980 bags. The trucks used to transport the shipment to market were swept out. Upon delivery of the harvest, 300 bags of the soybeans tested GM-positive, with over 4% of GM content, and he was not paid the 5% premium for that part of the harvest. The result was a total surprise for the farmer, who blames his loss on pollution of the seeds. The Paraná State government has done inspections to check the contamination of conventional soybean seeds on sale in the State. They apprehended 283 metric tons of conventional seed that had been contaminated with GM seeds, from eleven different seed companies. In some batches, as much as 9% of the seeds were transgenic.